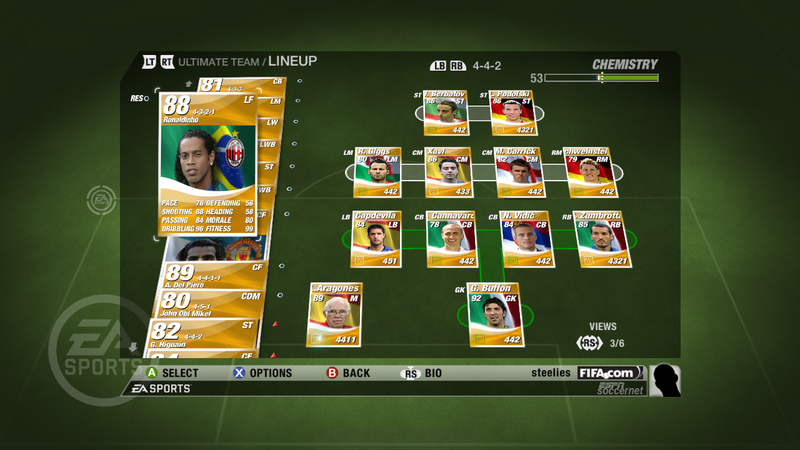 I would gladly say the Ultimate Team mode is an upgrade from the free alternative FO2. Instead of the terrible (my opinion anyways) match engine in FO2, Ultimate Team allows you to have the same game concept as FO2 but with the Fifa 09’s match engine, the smooth and sleek version which caught me by surprise how fantastic it was. Of course with that it means that it comes with a price tag. Nevertheless I believe Fifa fans would appreciate the thought put into providing more gameplay and replay value into Fifa 09 before Fifa 10 gets released. 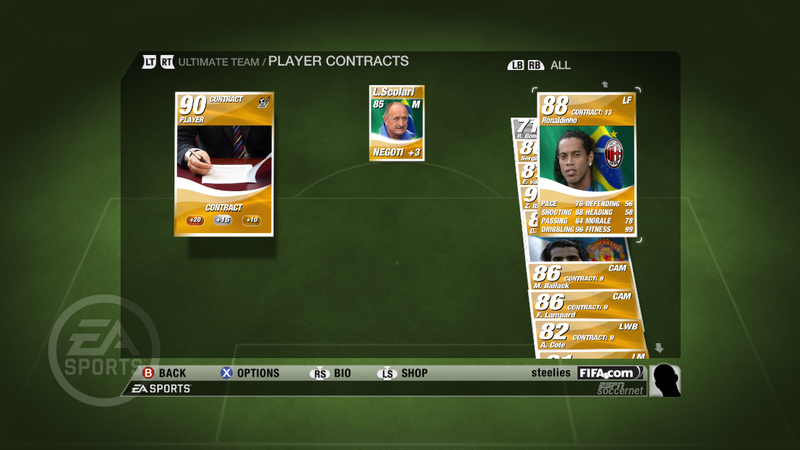 Basically Ultimate Team puts you into the owner of a whole new club. 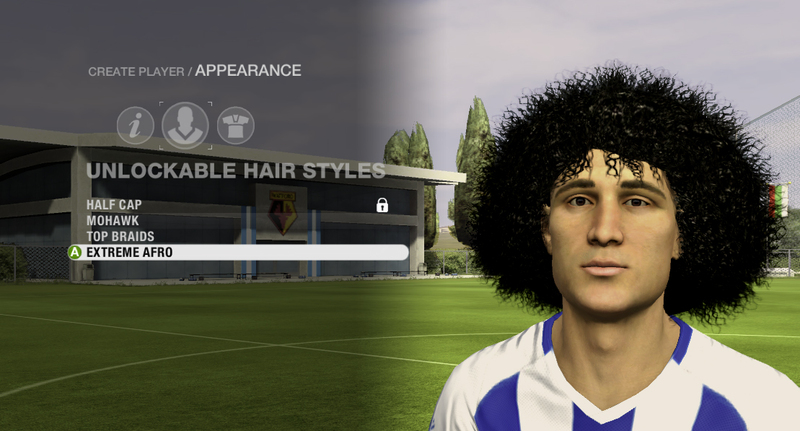 You can choose and come up with the club’s name, and create a star player as well. This player would be and should be your best player at the early stages. Of course he can become godly as well if upgrading/training cards are spent on him. 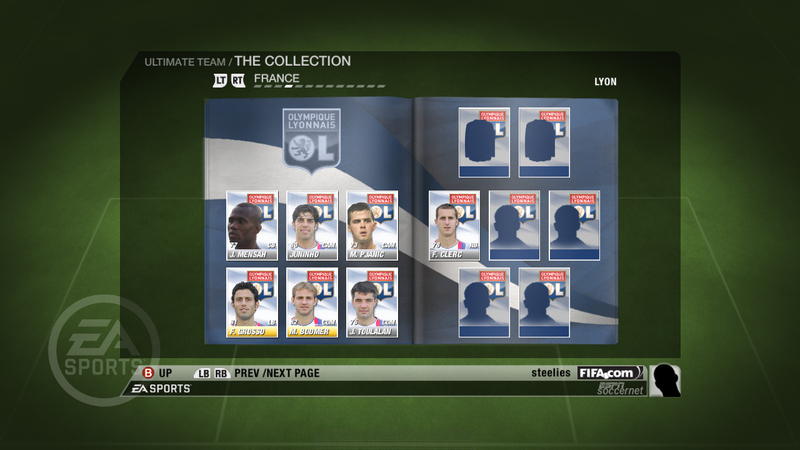 The creating player stage is rather simple; you choose how your player looks like and his position. With that, you get your first deck of cards which gives you players to play with. Don’t expect Cristiano Ronaldo or Peter Cech to be in your team at the start. You’ll most probably have players whom you have the slightest hint of who they are. But that is the whole point of the game! 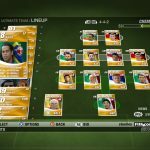 To build your own ultimate team from scratch! 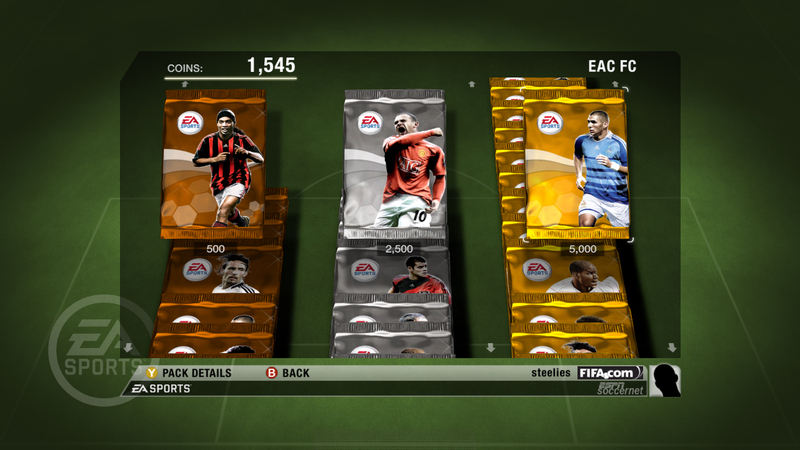 Upon creating your team, selecting your first few players etc, you’ll be greeted with the main screen of the mode. From there on, you can choose to adjust your team, buy cards, set the options so on and so forth. I’ll be looking into several additions and the core gameplay concepts and functions in this mode. Firstly would be the buying of cards. Cards come in packets which can be purchased using real money or in-game coins. There are 3 category of packets, bronze, silver and gold. Bronze being the most basic and Gold giving you a glimmer of hope of getting a star player like Ronaldinho. As soon as you purchase a set, you get to “open” the pack and see what cards you got. From there, you can select the cards you like and discard/add to your collection. 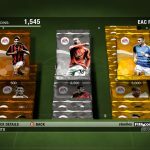 There is a limit of player cards you can have concurrently and therefore there is the need to discard them by the different various methods available. Build your very own dream team. There are different types of cards you can receive. I basically categorized them as “Player”, “Power-ups”, “Staff”, “Training” and “Misc” cards. Of course in the game itself they have their own specific category name but that is the way I’ll like to generalized them and group the cards. Player – The people you are going to have in your team playing in the field. Power-ups – Gameplay modifiers that can give you a significant boost in your match with your opponents. For example there are strict referee cards and when used, will cause referee to be extremely strict with the opponent so much so as to give the red card on the slightest touch. Staff – Manager, coaches etc. All these people give you bonuses in terms of extra points whenever a training card is used etc. Training – Cards that increases your players attributes for example their pace, passing etc. Misc – Other cards such as club logo, club jersey and everything else. Sometimes you might even get an extra free deck if you’re lucky. There is a function within the game which allows players to sell their cards in an auction based manner. Players who would like to sell their cards, must first set the starting price for bidding. From then on they can choose whether to or not to place a BNP (Buy Now Price) as well as the duration for the auction. The card will then automatically be placed publically for everyone to view, allowing them to bid if they feel like getting the card. Players can browse through the available cards up for bidding by just a simple button press. They have the ability to filter out cards that they don’t want through the selection of the different filters present for them. Through this trading of cards, players can finally build the dream team they always wanted. Oh yeah, create your star player however you want him to be. There are two main category of type of matches. From those two, you can sub-categorized them further into Online and Offline. The first type of match is like your any other normal matches. That is you get matched up with some random guy over the net or with a CPU team, and you basically play over 90 in-game minutes with you having a chance to win, lose or draw (There is no extra time nor penalties in this mode). If you win, you get more skill points as well as in-game coins. Draw or lose and you will still receive some, but not as much. The other match would be a tournament knock-off style where you and several other players would be competing for the championship trophy. It is same as of the normal matches, just that you participate using Skill Points in the different level of trophies and if you win, you proceed to the next round. The way the tournament works is fun and quick. In other words there is no waiting for a particular set of players to finish their matches to proceed. It works in the manner that when you win the first round, you will proceed to the second immediately, allowing you to compete with a pool of players who are in the second round to proceed further. As such, tournaments can be completed within an hour or so. Whenever you play online whether is it the normal matches or the tournament, your opponents are randomly picked. When I say random I really mean random. The system does not match you will opponents of same calibre in terms of their teams and sometimes you will face matches of Manchester United against Oxford United or rather in local context Singapore against Spain. Many will emphasize that the player own skills matter the most but still, a kid who just started playing using a 5 star team would have a greater advantage over a veteran who is using a 2 star team. This isn’t much of a problem since you can choose to not match up with that person simply by backing out of the match before it starts. However, due to the fact that the most basic tournament that supposedly caters for the newer and lousier teams are filled with 5 star teams, it is almost impossible for one to win the cup with a team lower than 4 stars. I really suggest that EA put in place a level system or team requirement system whereby it kicks out all those 5 star teams. Come on using Barcelona winning a Coca Cola League 2 team isn’t honourable or anything. P.S I won a 5 star team with a 2 and a half star team just today. Extremely funny, felt like mocking that person but I think I should stay humble. Bugs and errors are present in the game. If it is out to be sold to the public I expect the fundamentals to be done right. Yup most of the gameplay is working smoothly but some minor defects make it irritating. For example there are no benefits in winning a 5 star team with a 1 star team. You expect the team difference modifier to be higher but no, it remains at 1.00, giving you no incentives for winning those people who get a kick of their triumph over the weak. I suppose that function would be up sooner or later, but till then I won’t be wasting my cards on totally uneven matches. Another irritating thing would be the game freezing. I just experienced it once when I tried to use a power card in-game. Upon selecting it, the whole game freezes and I had to restart my PS3. EA, fix it please, it isn’t funny when you’re in the finals of a tournament and you’re winning a team filled with Messi, C.Ronaldo, Fabregas, John Terry, Cech. Choose from bronze, silver or gold cards. Gold of course gives your the chance of getting the golden boy of the year. Besides the unbalanced gameplay as well as the frequent freezes, I would say that for a price tag of $14 SGD would keep the game alive till Fifa 2010 is released. I would not say that the concept is extremely new or does it have the wow factor, but still having to build a team and trashing those bullies gives players a sense of achievement. I don’t really like how they allow cards to be bought using real life money for those rich kids would definitely have a head start in the game. But of course the game is developed by EA and EA are known for their money making techniques so what can I say? I would recommend the DLC to avid fifa fans as well as people getting tired of the online ranked matches. The DLC would definitely increase the fun factor as well as allow people to realise their dreams of playing the world’s best players together. See a whole album of the cards you have collected. Remember to frequently extend the contract of your players else they will disappear into thin air! The freezing is horrible. I’m starting to feel like I’ve wasted my money because of this issue alone. How often are you facing it?